Christopher Nolan’s Dunkirk Triumphs at the India Box Office! Dunkirk, the much-anticipated new cinematic event from director Christopher Nolan, battled to the top of the [territory] box office on its opening weekend debut, earning an estimated Rs.15.57 Crore Gross across 417 screens including 10 IMAX screens and still going strong. The announcement was made a few days ago by Denzil Dias, Managing Director, Warner Bros. Pictures (India). Dunkirk’s opening is the biggest opening ever for a Non-Dubbed MPA film and is also Biggest IMAX opening for a MPA film. 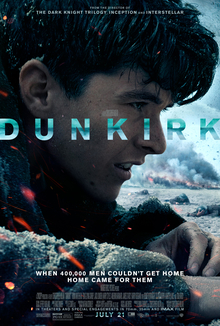 Directed by Christopher Nolan (Interstellar, Inception, The Dark Knight Trilogy) from his own screenplay, Dunkirk features a multigenerational cast, including Fionn Whitehead, Tom Glynn-Carney, Jack Lowden, Harry Styles, Aneurin Barnard, James D’Arcy and Barry Keoghan, with Kenneth Branagh, Cillian Murphy, Mark Rylance and Tom Hardy.The film was produced by Emma Thomas and Nolan, with Jake Myers serving as executive producer. Warner Bros. Pictures presents a Syncopy Production, a film by Christopher Nolan, Dunkirk. Opening in conventional theatres and IMAX, the film will be distributed by Warner Bros. Pictures, a Warner Bros. Entertainment Company. Interstellar (2014) Movie Review: Love, Love Me Do, Maybe More.